C.B. Fleet Co. Inc./Fleet Laboratories, Lynchburg, VA, spe­cializes in the manufacture of feminine care and gastro care products. For many years, the company had been shrink-wrap bundling multi-counts of products for shipment to various customer outlets. The bundles make it easier for Fleet’s customers to handle product warehousing and store-shelf stacking. 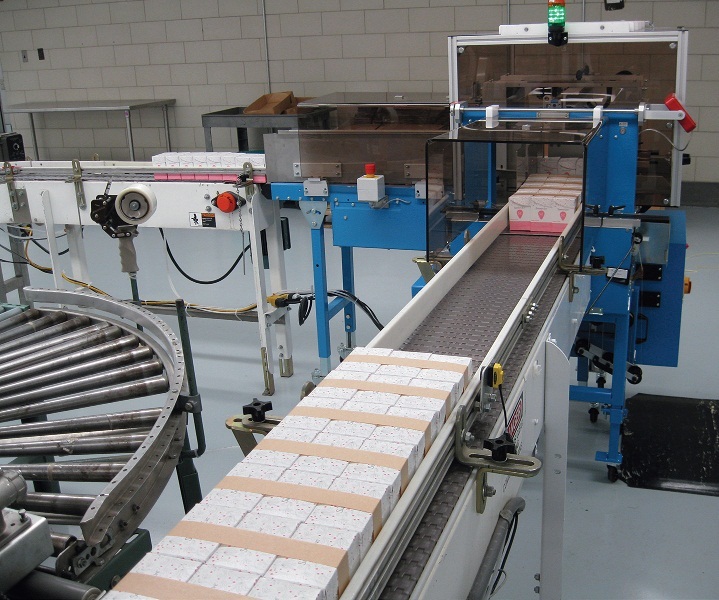 But some of their shrink bundling equipment was getting old and no longer was meeting Fleet’s cost- and operating-efficiency expectations.In particular, the cloth product (feminine care product) packaging line had a bundler and heat-shrink tunnel that were more than 20 years old. Fleet staffers found themselves spending too much time doing downtime maintenance on this equipment. In addition, plastic film scrap was excessive, and electrical costs were approximately $6,700 per year to operate these two pieces of equipment alone. On a quest to improve the cloth product packaging line, Fleet project engineer Steve Overby and draftsman/designer Rick Guerin evaluated options and chose to replace the shrink-film bundling system with paper banding equipment. Banding presented itself as a simpler, far less packaging material-intensive alternative to shrink film bundling. 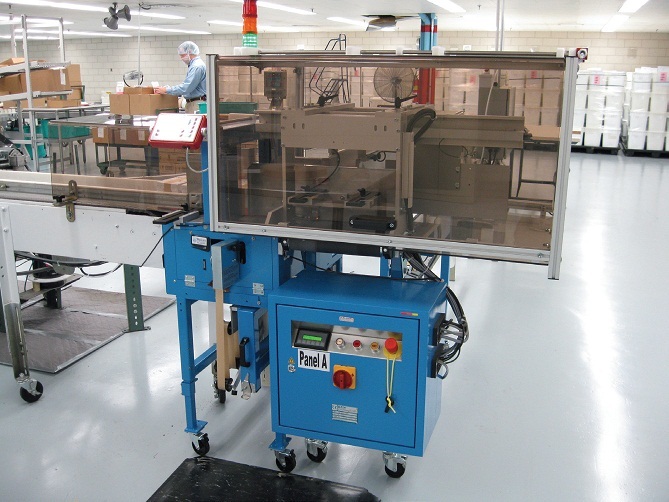 Fleet selected the Model ATS US2000 bander from Wexler Packaging Products, Inc. (www.wexlerpackaging.com) for their Summers Eve Cleansing Cloth packaging line. Overby notes, “We chose the Wexler machine for several reasons. First, it has a very small footprint (L-shaped, approximately 5’ x 6’ x 2.5’, including infeed conveyor), and floor-space conservation is very important to us. The digital display system also is user-friendly and simple to operate, while still being a highly sophisticated piece of machinery. And the cost savings in electricity and in packaging materials easily justified the purchase of the machine.” Wexler’s Regional Sales Manager Danielle Ritenuti was very instrumental in helping Fleet develop its strategy for changing over to banding. Overby recalls, “Ritenuti helped us to understand both the economic and environmental benefits of banding for our operations. She was honest and straightforward about where banding was an optimum fit for our product packaging operations and where it wasn’t. The bander was installed in August 2011. Overby reports, “The installation was done by our maintenance personnel without the need for any outside support. Wexler Packaging technician Michael Walsh was on-site for training and start-up. Michael went above and beyond the call of duty with training. He arranged his schedule to accommodate first, second, and third shifts. This allowed us to train our operators and maintenance staff without disrupting the production flow or our employees’ schedules. The quality of training was excellent. When the technician left, we were able to stand on our own feet and run the machine.” Overby adds “The start-up was the smoothest and most trouble-free start-up of any piece of equipment that I can remember installing. 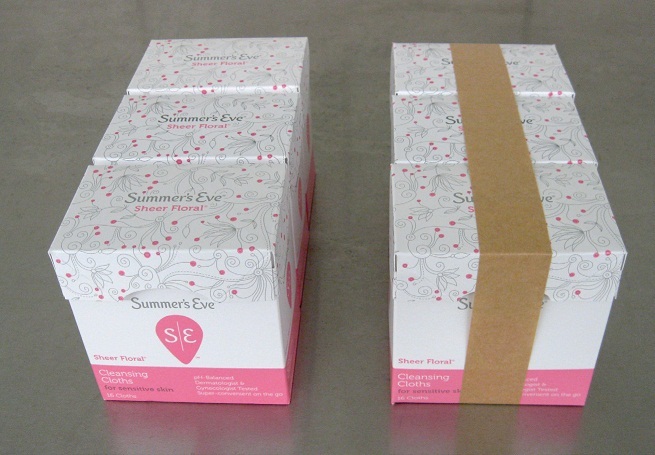 The Wexler bundler is almost a ‘plug-and-play’ piece of machinery.” The Summers Eve products are packaged in 16-count paperboard cartons, supplied by Chesapeake Pharmaceutical and Healthcare Packaging (www.chesapeakecorp.com). The hand-packed cartons are printed in four colors using a dry offset printing process. After the cartoning procedure is completed, the cartons are grouped into 3-counts for banding. Bundle dimensions are 73⁄4” wide x 33⁄4” deep x 4” tall. The banding material is 70-gram brown Kraft paper, poly-coated to allow ultrasonic sealing. The banded cartons then are manually packed in corrugated shipper cases supplied by International Paper (www.internationapaper.com). Case coding equipment is supplied by Markem-Imaje (www.markem-imaje.us).